Beanie Boppers debuted at the Dallas Toy Gift Show on June 23, 2001. The first six were all girls. Their names were Huggable Holly, Pretty Patti, Rockin' Rosie, Loveable Lulu, Kooky Kandy and Sassy Star. This product line was targeted towards pre-adolescent girls. Beanie Boppers don't have poems like Beanie Babies, but they have names, birthdays, hometowns, interests, personalities and other characteristics that were once listed on their own page at the Ty Internet site. The suggested retail price of the Beanie Boppers was $9-$10. Some Beanie Boppers wear replicas of sports team uniforms representing baseball, hockey, rugby and soccer. Others are dressed in hip fashions that were trendy at the time they were produced. On August 5, 2001, Ty introduced the first boy Bopper, Bronx Bomber. Bronx Bomber was given away as a promotion to children attending New York Yankee baseball games in August 2001. He was soon followed by more Bopper boys, some only available at baseball stadiums. The Bopper line also included several exclusives that were only available in either Canada, England or Germany. There was even a USA exclusive and one Bopper that was available only to members of the Beanie Baby Official Club (BBOC). Beanie Boppers were made with 56 different names. Three of them; Christmas Carol, Hat Trick Hunter, and Striker came in two distinct varieties (for a total of 59 different Boppers). All of the Beanie Boppers had first generation swing tags. On December 30, 2004, any remaining active Boppers were retired. In June 2002, Ty introduced Teenie Beanie Boppers, smaller 8-inch versions of the Boppers. 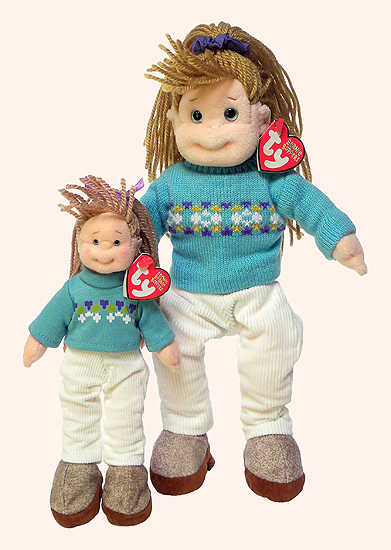 After the Beanie Boppers retired in 2004, Ty did not introduce another new line of dolls until February 2007, when the Ty Girlz made their appearance.